Last week, Devon Air Ambulance attended the final of PwC’s West of England Business of the Year Awards in Bristol. The event has been the region’s most prestigious business awards for the past 29 years, so to celebrate the 30th anniversary, and to conclude the awards programme, businesses that have previously won were invited to re-enter for the grand finale. There was a consistently high level of performance at this year’s awards, with businesses demonstrating superb figures and acknowledgement being paid to the successes of previous years. 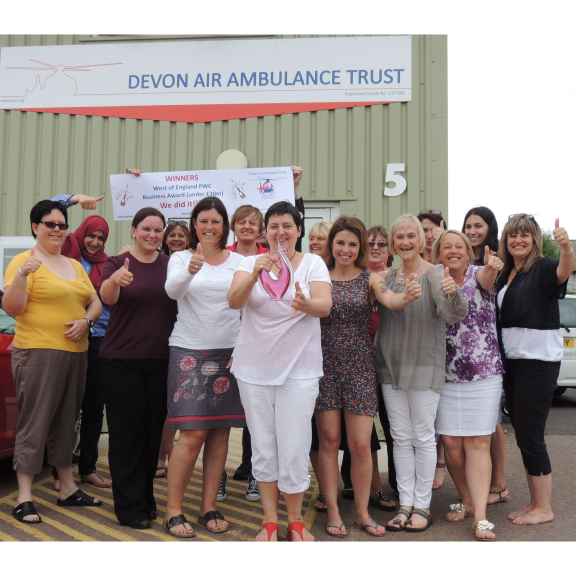 Devon Air Ambulance is the beneficiary of a number of businesses that support the charity. ‘One of the benefits of working in the sector is the willingness of people to help. Those who support us are not only individuals such as donors and volunteers, but also businesses and other charities,’ says Devon Air Ambulance’s Finance and Infrastructure Director, Dave Hawes. The evening featured a number of success stories as well as a moment to pause and see how much Devon Air Ambulance has achieved, not just over the three years since the charity won the Business of the Year award, but also in the twenty-three years preceding it.